If I bit it today, the obit would say I was a writer who struggled to move beyond 2,000 word blog posts about what happened this past week at Subway. Survivors include the love of her life and two naughty kitties. If I cashed in at 22, it would say I was a college graduate who designed a nonprofit’s newsletter and reported the deets of high school tennis matches, both while wearing the clothes I slept in and bravely facing the shames of having negotiated last call at the Smiling Moose the previous night. At age 6, I was getting pretty good at coloring. The key was to trace the black lines of the picture with heavy-handed Crayon-ing, then to shade in the insides using the same color. Take that, Picasso. At 40-something, who knows. 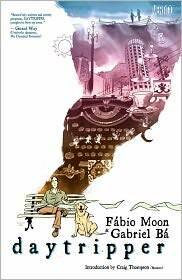 Daytripper by twin brothers Fabio Moon and Gabriel Ba is a nonlinear collection of stories about Bras de Oliva Domingos, whose mere birth is the stuff of family, if not urban, legends. He’s a traveler, a kite enthusiast, an obituary writer and eventually a novelist. He falls in love a few times, has a son, and has a crippling case of daddy issues. At the beginning of each of these stories, told with lovely full-color, super detailed imagery, Bras is dropped into a new adventure, each that will prove fatal by the end of the chapter. Stops off for a drink, gets shot. Visits his father’s study hours after the old man has kicked it and while his own son is sliding down the chute, keels over. Each chapter ends with a few words, a blurb from the obituary Bras would have at that point in his life. Even as they all end the same, each story is a slice of life and includes small moments that are actually big and big moments that are especially big. Bras is a little ho-hum emo, living in the shadow of his father’s career in literature and taking it super personally, but otherwise likable. He is surrounded by a cast of quick-hit characters who make reappearances, including his sidekick Jorge (who comes to his own startling end) and his wife (with whom he almost has a meet-cute, if not for Bras getting snuffed on the way. In the end, Bras becomes an old man, terminally ill, who finds some final words from his father that make everything clear: Only when you accept that one day you will die will you be able to let go and thoroughly enjoy life. This is a nice collection with plenty of dips and dives and dekes and great art.